After 3 days in Jodphur, we moved on to our next destination. 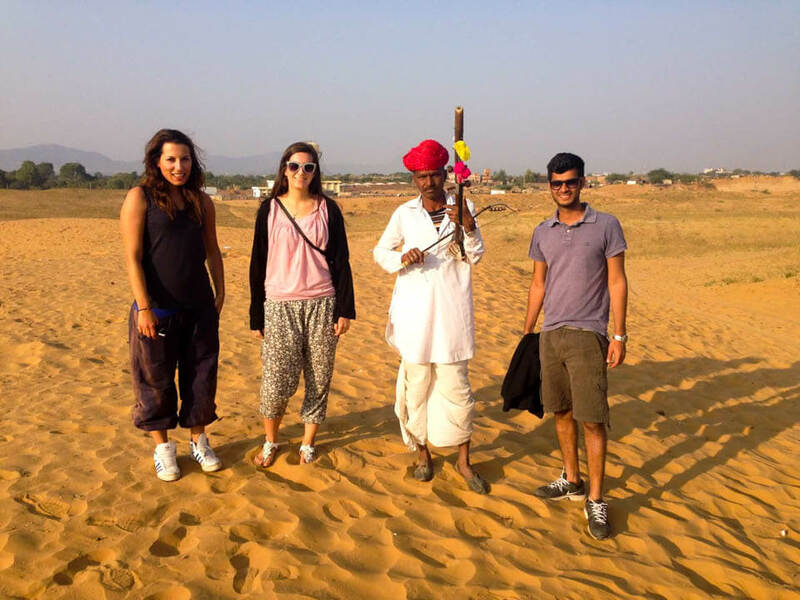 In Pushkar I really felt the Indian vibes, away from big cities and main tourist places. Therefore, I will share with you the 6 most important sights in Pushkar. In Pushkar we stayed in Mama Luna. It is a hotel/hostel run by a Spanish lady, who moved there many years ago. It is a very cute and colorful place with a nice terrace on the top floor of the building. The perfect place to have breakfast, lunch or dinner and get all cozy in between many cushions and mattresses which spread out over the floor. The most famous Aarti ceremony takes place in Varah Ghat. It starts at 19pm the summer and at 5:30pm in the winter. Aarti is a Hindu ritual in which a candle or lamp is lit, which is the symbol of a deity. There is a lot of singing, incense sticks and rose petals involved. 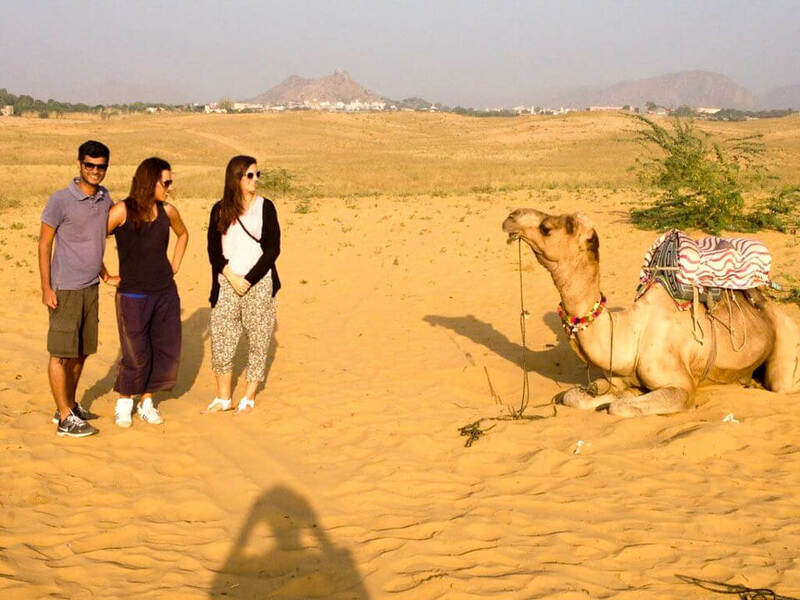 We decided to make a camel tour in Pushkar. If you are interested in it as well, the receptionist of your hotel/hostel will help you arrange this trip. For around 1000 RS (14€) we were ready to go on a 3 hours camel ride. We started our tour somewhere in the city and then slowly went out to the desert. 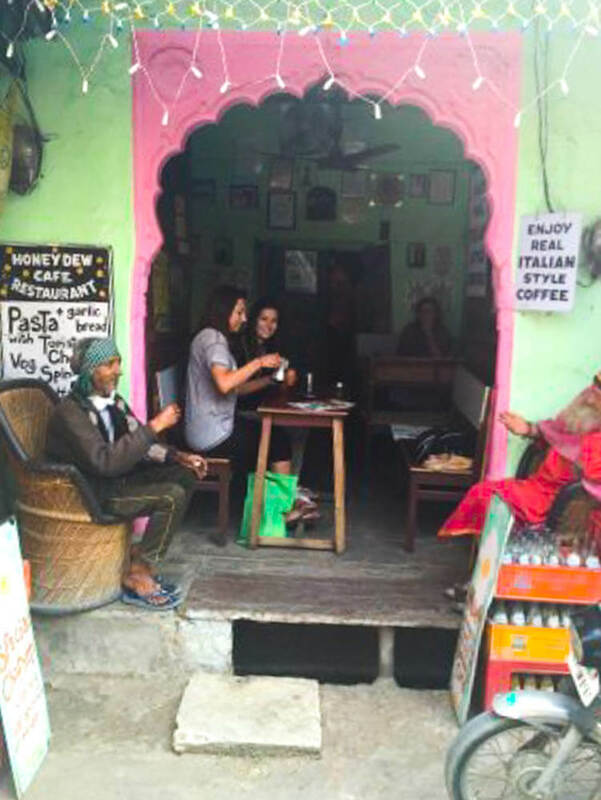 We took a break in a desert village for a great masala tea. Afterwards we stopped in Thar desert in order to watch the most beautiful sunset and listened to a snake charmer. 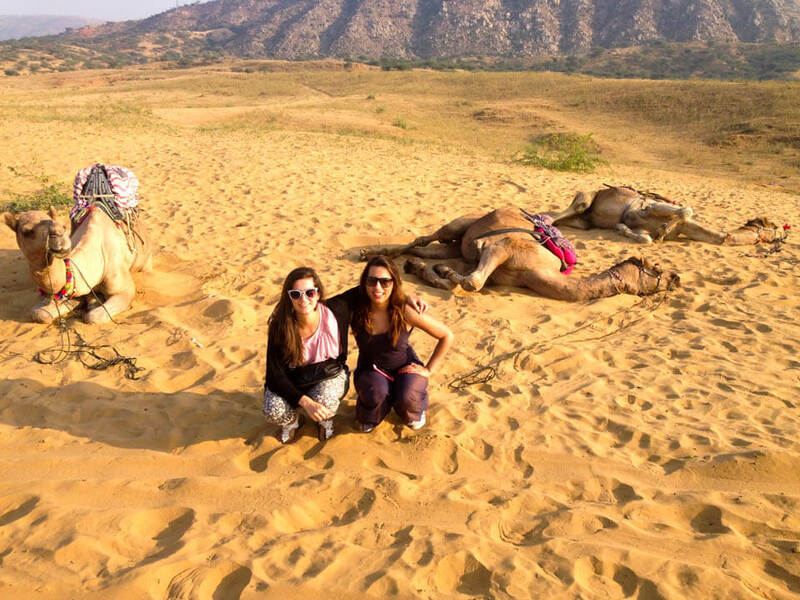 Did you know that there is a camel fair every year around November in Pushkar? Five days long, business men visit the fair in order to sell or buy new camels. The fair stretches out for kilometers and is full of camels, all lined up next to each other. In case you are interested in this, I recommend you traveling to Pushkar in November. Spend a few quiet hours on the stairs of the Pushkar sea and enjoy listening to the music. Be it hymns, bells, a gentle jingling of a guitar, etc. As you lose yourself in the music, the lake reflects the lights of the city and it just looks beautiful. Shopping should definitely be on the list when visiting India. The Pushkar market offers a good mix of ethnic and hippie culture. Pushkar Market is known for its traditional silver jewelry, ethnic clothing, leather bags and rose products. Do not forget to practice you negotiating skills to get the best prices. The most famous shops are Baza Bazar, Sarafa Bazar, Sadar Bazar and Kedalganj Bazaar. Another important sight in Pushkar is the Savitri Temple. It is just 15 minutes from Pushkar Lake and a few steep steps away. Get ready for a little workout and look for monkeys. They can be quite aggressive. Once at the top you will be rewarded with a very nice view over Pushkar. Music is part of Pushkar. In the evenings when sitting at the lake, walking through the markets, or attending an Aarti ceremony, you are surrounded by music everywhere. You will also find many people learning and playing their favorite instruments. Ask for Nathu Lal Solanki, a famous drummer, near Gangaur Ghat. With him you can learn how to play this local drum, called Nagara, for a low price. This entry was posted in Asia, Destinations, India. Bookmark the permalink. Hi I’m Sixtina and I’m an expat! I am all about real local experiences and living in different countries long term. You can find me doing a handstand at the edge of the cliffs, creating memories in a photo box or trying to eat spicy food without crying. I have too many great stories to tell, insider tipps and amazing photos to keep them all to myself. I hope you will follow along my adventures and I promise that I will keep you entertained, deliver informative resources and fun Instagram stories live from the spot. Get your free City Guide now! Sign up for my monthly newsletter for more freebies. Wir benötigen Ihre Einwilligung zur Verwendung von Cookies und zum Sammeln von Daten wie IP-Adressen, die es uns und unseren Third-Party Werbepartnern ermöglichen, die personalisierten Inhalte, Anzeigen und Messwerte, die diese Website unterstützen, bereitzustellen. Indem Sie auf “Akzeptieren” klicken, stimmen Sie der Erfassung dieser nicht sensiblen Daten zu. Klicken Sie auf “Akzeptieren”, um fortzufahren, oder auf “Einstellungen ändern”, um zundern, welche Daten gesammelt werden, oder um die Datenerhebung abzulehnen. Lesen Sie unsere Datenschutzerklärung um mehr zu erfahren.